1. Improved Picture & Video editing – Powerpoint will have improved and more advanced picture and video editing features. You can perform basic editing and add effects like trimming, fades, reflections to photos & videos. 2. Connect & co-authoring – Word 2010, PowerPoint 2010 and OneNote 2010 lets you work on a file with multiple people simultaneously from different locations to brainstorm ideas, control versions better and meet deadlines faster. 3. Office on Web – Now you can work on Microsoft Word, Excel, PowerPoint and OneNote documents online using Office on web and access documents from internet connected phone or computer. 4. 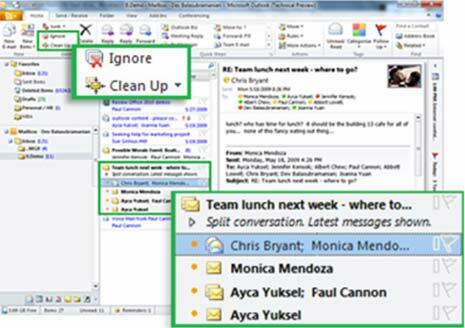 Manage large amount of emails – Outlook 2010 improves the tracking and managing of e-mail conversations. It compress your long e-mail threads into a few conversations that can be categorized, filed, ignored or cleaned up within a few clicks. 5. New analysis & visualization features – With new data analysis and visualization features in Excel 2010, you can easily track and highlight important data trends. 6. Videos in Powerpoint presentations – With PowerPoint 2010, you can embed and personalize videos within your presentation. 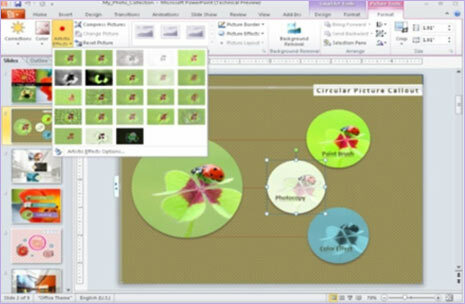 The embedded video file can be customized by adding video triggers and styles directly within PowerPoint 2010. 7. Store ideas & notes – With Microsoft OneNote 2010, you get the ultimate digital notebook for tracking, organizing and sharing your text, photos, and video and audio files. 8. Communicate & share – Business users can use the presence icon in Office Communicator when co-authoring in Word 2010, PowerPoint 2010 and Outlook 2010 to see who else is authoring a file at the same time. 9. Faster & easy menu access – The Microsoft Office Backstage view replaces the traditional file menu, helping you quickly get to operations such as save, share, print and publish with just few clicks. 10. Access to work documents – Office 2010 gives you a familiar and intuitive experience across PCs, Smartphones and Web browsers so that you have the freedom to use the system from more locations and on multiple devices. Note: As pointed by number of sources, Office 2010 leaked on torrets in infected with mallicious code. Avoid downloading it and wait for clean copy availability. nothing goods, i still like to use ms office 2003, less features but good! Can anyone tell me if I can 2010 along with the existing 2007 on my stand alone computer? If so, when I install 2010, will it import everything from my existing Outlook 2007 w/o my having to set up all mail boxes etc? If I can. how? As someone who blogs about OneNote from time-to-time, you may be interested to know the we have created the ultimate online destination for OneNote fans called iheartonenote.com. We have over 8,000 registered users who share tips and tricks, upload videos and notebooks and generally share their love for OneNote. I would love to find ways to cross promote with you – whether we exchange links or you do a guest blog on the site or whatever! Please contact me at info@iheartonenote.com to discuss.